Let’s all go swimming (in the backyard)! Seriously, enough with the rain. Even though my Number 1 resolution was to stop whining about the weather, whatever form it happens to take, ENOUGH WITH THE RAIN ALREADY. Our backyard has turned into a mud bog. Literally, ankle-deep mud. And that’s where there isn’t a pond. The ducks have a new creek flowing through their fenced area, so at least they’re happy. I watched them from the kitchen window for about half an hour today, swimming around and happily cavorting. The water in the way back of the pasture is deep enough for them to do their signature diving move – the one that leaves their feet kicking frantically up in the air. There’s even enough depth for underwater swimming. Sigh. They’re probably chasing salmon, there’s that much water. 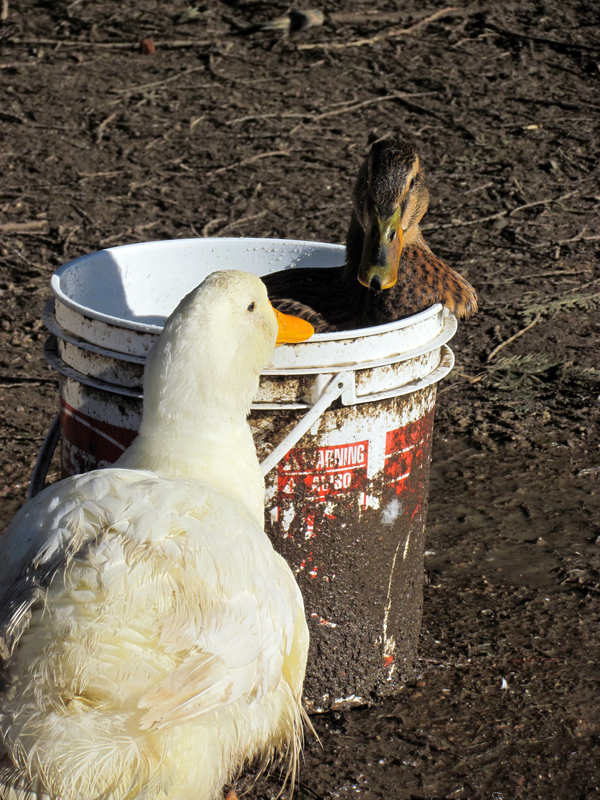 One of the ducks, though, isn’t obsessed with the newly soggy terrain — she loves her a bucket bath. Nevermind that she’s choosing to lounge (and worse) in the turkeys’ drinking water, and that she can’t actually get out on her own, she just wants a nice relaxing soak. When she’s had enough, she’ll start honking and fussing, prompting me to put on all my raingear to go fish her out. Even though I don’t spend nearly as much time outside during the rainy season, I’m far from bored inside. 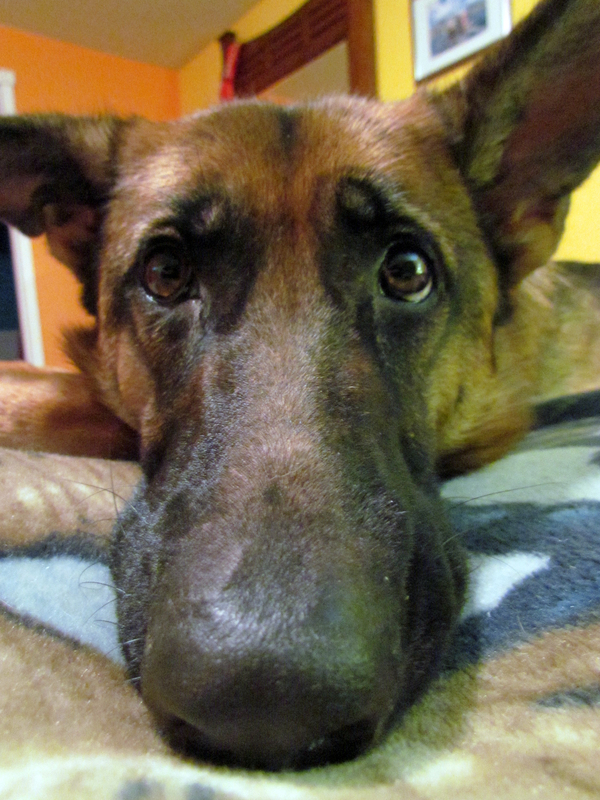 Ceri, the high-maintenance German Shepherd, has come down with another case of the severe itches, which then turned into all sorts of systemic infections within a week. The vet, who realized we dragged her in for the same reason this time last year, pronounced her afflicted with bad seasonal allergies. $350 and five medications later, including the world’s nastiest smelling shampoo, I’ve found myself with a new project. Medicating the Puppy. The ear drops are by far the worst, since she’s more protective of her ears than any dog has a right to be. Since Gene works nights, and isn’t here to help me hold her down, I’ve had to resort to the stealth approach, which involves syringing the medication into her ear while she’s sleeping. Then waiting a few hours until she trusts me again and falls back asleep to assault her other ear. At least the drops are only once a day. Her pills have to be given twice, and she’s got the most uncanny ability to separate food from pill that I’ve ever seen. I’ve tried hiding them in scrambled eggs, chunks of chicken, deli meat, peanut butter, and gravy, but at the end of the snack the food is entirely gone and perfectly clean pill chunks remain. I so wish she was more like Chupi, who Hoover’s his food so quickly I swear he’s never chewed a morsel in his life. It goes straight from bowl to stomach. Chupi loves when Ceri’s on medication, since obviously you can’t give one dog a treat and not the other (have you ever seen a Papillion sulk? It’s not pretty at all.) About three days into it, Gene came up with the brilliant idea of grinding the pills up and hiding them in Little Caesar wet food, which is like the McDonald’s of canine cuisine. It might be nutritionally void, but at least it’s working! So when I’m not chasing an aggravated Shepherd around the house, or freeing a duck that’s too fat to get out of the bucket, I seek relaxation in the greenhouse. I can listen to the rain hammering the roof while I happily re-pot the three flats of seedlings I’ve already started. 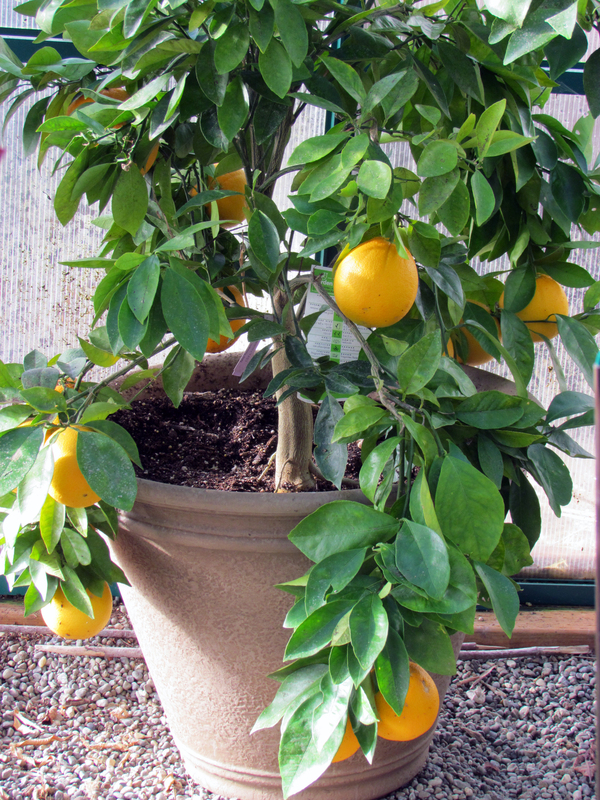 I can reach out and grab an orange off the tree in the corner, and there’s even strawberries to snack on! Thanks to the heated seed mats, I can grow them all year, and they taste so good in the middle of February. Maybe I should try hiding a pill in one of those.